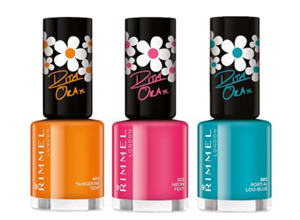 Rimmel’s new 3-in-1 Nail Colour Technology delivers a base coat, rich colour and glossy top coat finish. The chip-resistant, anti-fade, high-shine colour lasts up to 10 days. The quick-drying formula dries in less than 60 seconds*. The precision brush glides perfectly on the nail for a flawless professional-like finish. These are great, especially if I am in a rush or I want to touch-up my nails in a hurry. Super fast-drying and awsome colour. I love nail polishes and the colors available from this collection were to-die-for. The bottle itself is so cute and girly which caught my attention immediately. I love the cute little flowers and rita ora’s signature that was on it .The nail polishes are really opaque and they are so easy to work with. Since they are from the 60 seconds range , they dry really fast and i don’t have to worry about my manicure getting ruined.I have all the colors and they are all my favorite.I would purchase them again because they last really long and they look amazing on my nails. A definite must have for any lady. I have the Rita Ora range and it’s to die for. The colours are amazing. There’s something for everyone. They are also extremely opaque with the porta-loo blue I can get away with one coat. My fav is sweet retreat- beautiful pink. I love variety of colours available in this range – they’re perfect for spring as they’re bright and chirpy, and the floral packaging is just gorgeous too. The polish dries fairly quickly and has an even finish. I like the flat brush too as it means minimal messing and even application. My colour started chipping on day four, which disappointed me a bit as I can usually get five chip-free days out of most of my nail colours. Still, as they’re really affordable, they’re definitely a good buy. I don’t usually paint my fingernails (only toes) for this very reason. The application was smooth and hassle free and the finish flawless, however, the honeymoon didn’t last long enough. The polish started chipping after a day and when I removed it, my fingernails were stained blue for days. In a nutshell, if you only paint your toenails, this product is perfect for you. PS. The teal colour is amazing. I love trying new nail colours, and this one didn’t disappoint. I tried out “Peachella” – a pretty soft peach shade. I found that I had to apply two or three coats to really get the full effect of the colour, but the polish dries so quickly so it wasn’t a problem! I think this shade would be great for spring because it has an almost pastel look about it. I would definitely try other colours in this range!